NTSE Admit Card 2019 - NCERT will release the NTSE hall tickets for stage 2 examination in the month of May 2019 in the online mode. Candidates who have qualified the NTSE stage 1 conducted on November 3,4,18 & 25 in all 36 states/UTs can download their admit card of NTSE by clicking on the link provided below. They will be required to enter their state roll number, date-of-birth and captcha code given on the login page. A printout of the NTSE 2019 admit card must be carried on the exam day as no candidate will be allowed to write the exam without it. NTSE stage 2 exam 2019 will be held on June 16, 2019. Earlier, NTSE stage 2 exam was scheduled to be conducted on May 12 but got postponed due to Lok Sabha elections. Read the complete article below to know more about NTSE admit card 2019, steps to download it and more. NTSE Admit card 2019 of stage 1 was released in October 2019 by SCERT of all States and UTs. Some states released the admit card in online mode where candidates were supposed to take a printout and carry it on the exam day while others released it offline and candidates had to collect the same from their school authorities. The table below enlists the important dates related to NTSE 2019 stages 1 & 2 exam. Candidates must keep a note of the same to not skip any event. How to download NTSE Admit Card 2019 for stage 2? Successful candidates of NTSE stage 1 examination whose names have been recommended by States/UTs need to follow the steps below to download their admit card of NTSE 2019. Note- Candidates must check for the accuracy of the details mentioned in the admit card of NTSE 2019 stage 2. In case of any discrepancy, they must contact the NCERT officials and get them corrected. NTSE Hall Ticket 2019 - What does it mention? NTSE hall ticket for stage 2 was released online for the first time in 2018. It’ll be released only for those candidates whose names have been recommended by the State/UTs. The admit card of NTSE stage 2 includes candidature details such as his/her name, roll number, exam centre, date, timings. It is important that candidates carry their admit card of NTSE 2019 on the exam day. No candidate will be allowed to sit for the exam without it. 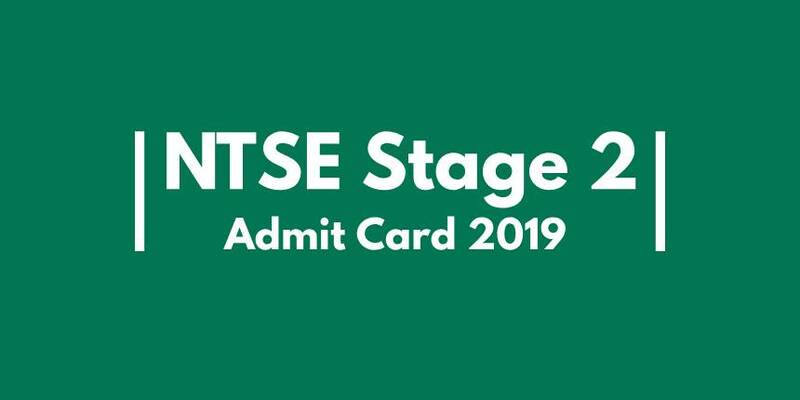 The link to download the NTSE stage 2 admit card 2019 will not be available to download after the conduct of exam. Therefore, candidates must download and keep copies of the admit card for future correspondence. Beginning this year. NCERT will offer 2000 NTSE scholarships, an increase of 1000 till 2018 to candidates who clear both the stages of NTSE 2019. Based on the reservation criteria, candidates of different categories will be awarded the same NTSE scholarship 2019 given below. Where to contact for any query related to NTSE admit card 2019 of stage 2? Candidates are advised to check the details printed in NTSE hall ticket 2019. For any discrepancy or query, they should contact the NCERT officials and get them rectified or sorted. NCERT has not prescribed the syllabus for the NTS 2019 examination. However, candidates are required to cover the syllabus of 9th and 10th class. A separate booklet called ‘Learn about the Test’ containing sample items for both the Tests- MAT and SAT is available in print as well as on the NCERT’s official website. Candidates can also read Best Books for NTSE 2019 for more on NTSE 2019 preparation. Candidates must go through the NTSE 2019 exam pattern thoroughly and make the best use of time and information available to perform well in the scholarship test. NTSE exam pattern 2019 makes one familiar with the marking scheme, timing etc followed in the exam. For better preparation of stage 2 of NTSE, candidates must download, practice and analyze NTSE sample paper or question papers. These will make them familiar with the question paper pattern, duration, number and type of questions asked, marking scheme and much more. Candidates can download the NTSE sample papers by clicking on the link provided above. Since the number of scholarships offered has increased, candidates will compete hard to win one. By now, candidates must have read through the entire syllabus and those who haven't must be on the verge of finishing it. Solving NTSE 2019 sample papers familiarizes one with the exam pattern and marking scheme of the exam. Candidates must solve the sample/question papers as many as they can for better preparation. Make notes of all the important notes and formulae and go through them once every day. These can also be referred to a day before the examination. Get all the doubts cleared by friends and teachers. Last but not the least, eat healthy, exercise and take proper rest. NCERT will release the answer key of NTSE 2019 stage 2 in the online mode after the completion of the exam. The answer key will contain all the correct answers to the questions asked in the exam. Candidates can check and compare their answers with those in NTSE answer key to arrive at a probable NTSE 2019 final score before the announcement of results. Cutoff is the minimum marks a candidate needs to qualify for the next stage. Those who achieved the NTSE cutoff of stage 1 qualified for the stage 2 exam. The cutoff for stage 2 exam will be released by NCERT after the conduct of exam on June 16, 2019. Candidates with their name in the final merit list will be awarded with the NTSE scholarship 2019. Candidates can get a fair idea on how much to score in stage 2 by looking at the cutoff trend of previous years’. The NTSE cutoff will be released along with the result of stage 2 in September, 2019. The NTSE cut off 2019 is expected to show a change due to the change in the exam pattern this year. Given below is the NTSE qualifying cutoff for different categories. NCERT will release the provisional result of NTSE 2019 in the online mode in September 2019. Candidates will be required to enter their roll number and date of birth to check their result. Along with the NTSE result 2019, NCERT will release the OMR sheets of all the candidates. Candidates can check their answers with the answer key and in case of any discrepancy of results, they can contact NCERT officials. The final NTSE stage 2 result 2019 will be out in September/October 2019.